I already expressed my predictions for 2018. One of the most interesting questions among them is the identification of the early Anatolian offshoot, and this is – I believe – where Genomics has the most to say in Indo-European migrations. Linguistics and Archaeology had already a mainstream account from Late PIE/Yamna onwards, and it has been proven right in Genomic investigation. There is, however, no consensus on Indo-Hittite. 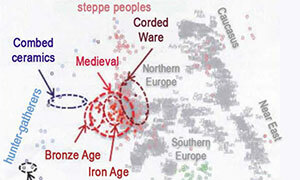 Apart from the Anatolian homeland hypothesis and its westward migration (as referenced e.g. by Lazaridis et al. 2017), the other possibility including the most likely steppe homeland is that Proto-Anatolian spread through the Balkans, and must have separated from Khvalynsk and travelled first westward through the North Pontic region, and then southward to Ezero. EDIT (10 MAR 2018): The Anatolian westward route within the steppe homeland model refers to the possibility that Proto-Anatolian spread south through the Caucasus, and then westward through Anatolia, as suggested e.g. originally by Marija Gimbutas for Maykop, as a link in the Caucasus. 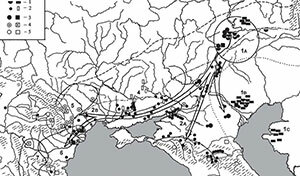 We all know that this Khvalynsk -> Novodanilovka-Suvorovo -> Cernavoda -> Ezero -> Troy migration model proposed by Anthony shows no conspicuous chain in Archaeology, but obvious contacts (including Genomics) are seen among some of these neighbouring cultures in different times. and the Suvorovo group in the Danube delta, roughly coinciding with the massive abandonment of old tell settlements in the area. One of the strongest cultural connections between Khvalynsk and Suvorovo Novodanilovka chiefs is the similar polished stone mace-heads shaped like horse heads found in both cultures, a typical steppe prestige object going back to the east Pontic-Caspian steppe beginning ca. 5000-4800 BC. Its finding in the Danube valley may have signalled the expansion of horse riding, which is compatible with the finding of ancient domesticated horses in the region. 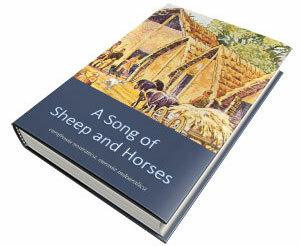 Horses were not important in Old European cultures, and it seems that they weren’t in Sredni Stog or Kvitjana either. 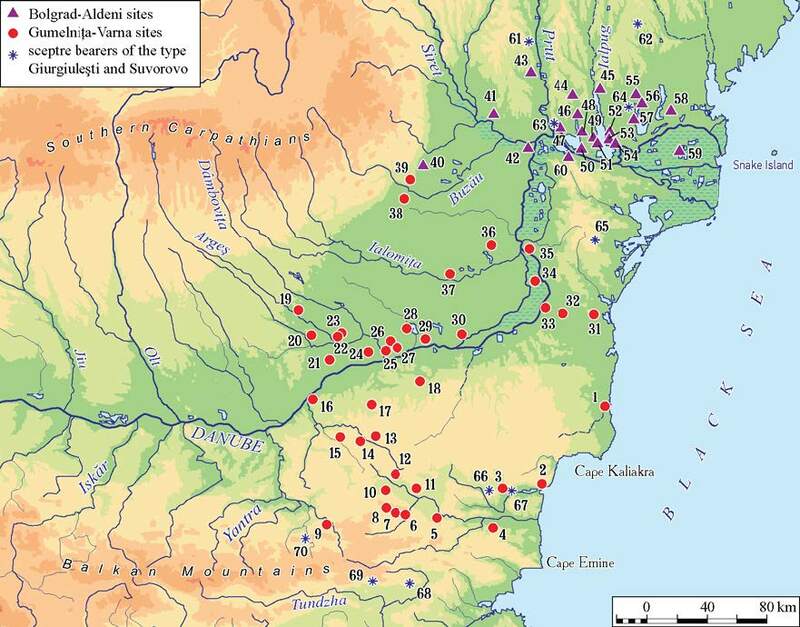 Steppe and Danubian sites at the time: of the Suvorovo-Novodanilovka intrusion, about 4200-3900 BC. David W. Anthony (2007). NOTE. Telegin, the main source of knowledge in Ukraine prehistoric cultures for Anthony, was eventually convinced that Surovovo-Novodanilovka was a separate culture. 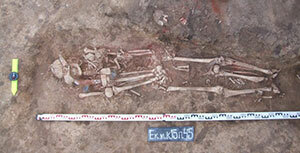 However, for Anthony (using Telegin’s first impressions), it may have been a wealthy elite among Sredni Stog peoples. Anthony considers Sredni Stog to have been also influenced by Khvalynsk, and thus potentially related to the Suvorovo-Novodanilovka chiefs. 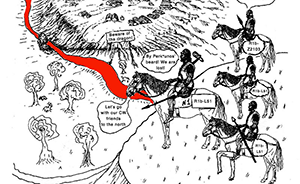 Nevertheless, he obviously cannot link North Pontic Eneolithic cultures to Khvalynsk nor to horse riding – whilst he clearly assumes horse riding for Novodanilovka-Suvorovo chiefs – , and he does not link North Pontic cultures to later expansions of Late Proto-Indo-Europeans from late Khvalynsk and Yamna, either. 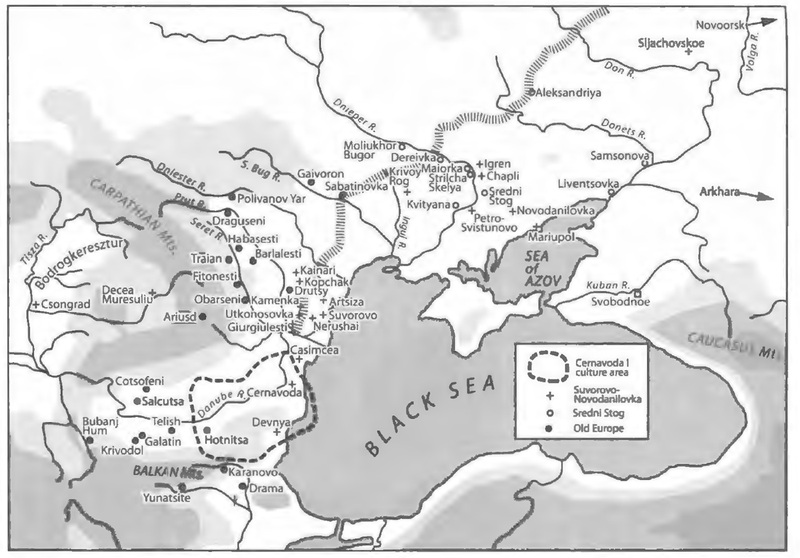 The question here for Anthony (as with further Proto-Anatolian expansions described in his 2007 book), in my opinion, was to offer a plausible string of connections between Khvalynsk and Anatolia, and the simplest connection one can make among steppe cultures is a general, broad community between North Pontic and North Caspian cultures. 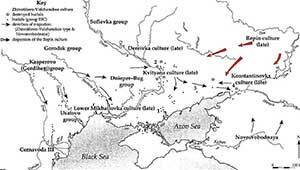 That way, the knot tying Khvalynsk to the Danube seems stronger, whatever the origin of Suvorovo-Novodanilovka chiefs. 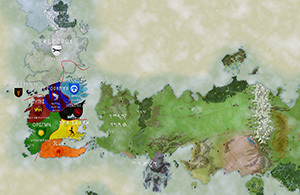 If, however, a direct genetic connection is made between Suvorovo-Novodanilovka chiefs and Khvalynsk – as in its association with R1b-M269 and R1b-L23 lineages – , there will be little need to include Sredni Stog or any other intermediate culture in the equation. We have already seen a movement of steppe ancestry into mainland Greece, and I would not be surprised if a parallel movement could be seen from Ezero to Troy (or a neighbouring North-West Anatolian region), so that the final migration of Common Anatolian had in fact been triggered by the massive steppe migrations during the Chalcolithic. NOTE. 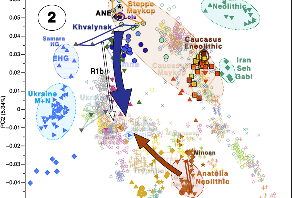 Whereas we are certain to find R1b-L23 subclades in the direct Balkan migrations from Yamna, the link of steppe->Anatolia migrations may be a little trickier: even if we find out that the Suvorovo-Novodanilovka expansion was associated with an expansion and reduction of haplogroup variability (to haplogroups R1b-M269 and R1b-L23), we don’t know yet if the ca. 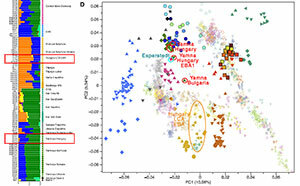 1,500 years passed (and the different cultural and population changes occurred) between Proto-Anatolian and Common Anatolian migrations may have impacted the main haplogroup composition of both communities. A probably unsurprising – because of its previously known admixture and PCA – , but nevertheless disappointing finding came from the Y-SNP call of the haplogroup R1 found in Varna (R1b-V88, given first by Genetiker), leaving us with no new haplogroup data standing out for this period. This sample’s lack of obvious genetic links with the steppe and early date didn’t deter me from believing it could show subclade M269, and thus a sign of incoming Suvorovo chiefs in the region. After all, R1b-P297 subclades seemed to have almost disappeared from the Balkans by that time, and we know that assessments based only on ancestral components and PCA clusters are not infallible – we are seeing that in many, many samples already. NOTE. In fact, the first time I checked Mathieson et al. (2018) supplementary tables I thought that the ‘Ukraine_Eneolithic’ sample of R1b-L23 subclade was ‘it’: the first clear proof in ancient samples of incoming Suvorovo chiefs from Khvalynsk I was looking for…Until I realized its date, and that it was more likely a Late Yamna (or Catacomb) sample. 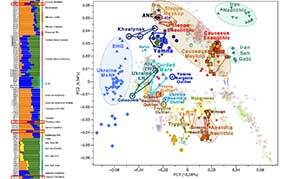 Steppe ancestry is found in the Varna and Smyadovo outliers, though, and these samples cluster closely to Ukraine Eneolithic samples (which are among Khvalynsk, Ukraine Neolithic, and Anatolia Neolithic clusters), so some population movement must have happened around or before that time in the region, and it is obvious that it happened from east to west. 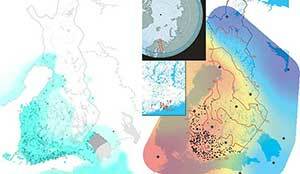 b) Or else they still show mixed lineages, reflecting an older admixed population of the Pontic-Caspian steppe – as the early Khvalynsk and Ukraine Eneolithic samples we have now. NOTE. Even though my preferred model of migration is through the Balkans – due to the many east-west migrations seen from the steppe into Europe – , there is no general consensus here because of the lack of solid anthropological models, and there are cultural links found also between the steppe and Anatolia through the Caucasus, so the question remains open.